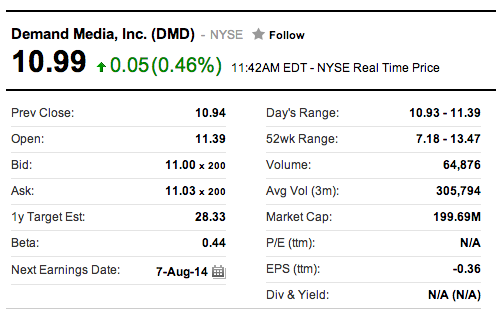 Demand Media spun off Rightside, and the company began trading on the Nasdaq stock market on its own this week. This gave us an opportunity to see the market capitalization of each of these companies independently. 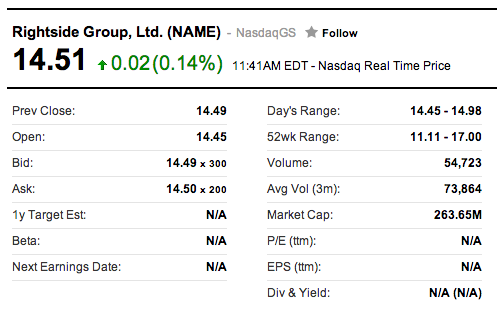 According to Yahoo Finance, at the time I began writing this article this morning, Rightside (ticker symbol: NAME) has a market capitalization of $263.65 million, as it is currently trading at $14.51 a share. Demand Media (ticker symbol: DMD) has a market capitalization of $199.69 million, as it is currently trading at $10.99 a share. There is a very good chance these numbers will fluctuate to reflect the current trading that is ongoing, so when you read this article, the numbers presented may no longer be accurate (and most likely won’t be accurate). According to YCharts.com, shortly before Rightside was spun off from Demand Media, the entire company had a market capitalization of $494.67 million on July 31, 2014. If you add up the current market capitalization of these independent companies as of the time of publication, the total combined market cap is around $30 million lower than on July 31. Looking back a bit more historically, the combined market cap is much higher than it had been earlier in the year. 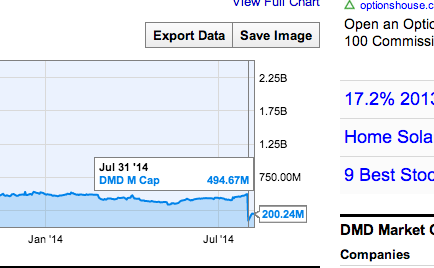 For example, on May 12, 2014, the market cap for DMD was $341.62 million. It is going to be interesting to continue tracking DMD and NAME stocks to see how they perform separately. I have no financial background, so I am not going to speculate. I want to make it very clear that I have no financial background, and there is certainly a chance I am interpreting some of this information incorrectly. I do not believe I own any stock in either company at this time, although that might change.